FAQ: Do you publish books? No, probably not the way you mean it. We do everything a publisher does, but the author or business pays us. The author controls all the rights, all accounts are in their name, and they receive 100% of royalties. FAQ: What is the difference between AuthorImprints and a company like Lulu, Outskirts, or Author Solutions*? The differences are substantial, all in the favor of you the author. In both cases, you are paying money to be published, buy books, etc. But with AuthorImprints you keep 100% of the royalties, get to keep all the files and buy books at cost. Most importantly, every account and registration is in your name and books are always custom designed. It also helps that you will most likely spend less and have far more personalized service! * AuthorHouse operates under a range of brand names such as Xlibris, AuthorHouse, iUniverse, Trafford, WestBow Press, Balboa Press, Abbott Press. FAQ: What is an imprint? It is simply the name of your publishing company. It is referenced in your ISBN record, copyright filing, Library of Congress filing and distribution accounts. It is displayed online where your print book, and sometimes your eBook, is listed for sale. FAQ: Does AuthorImprints get a commission or royalty for books sold? 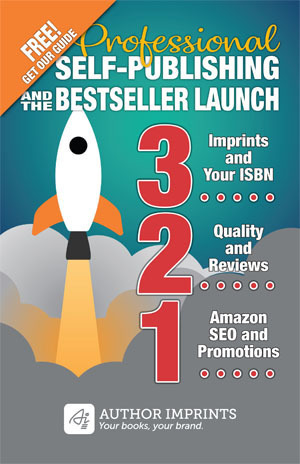 FAQ: Does AuthorImprints provide an ISBN? No, because you are the publisher, not AuthorImprints. We help you purchase and use ISBNs correctly. You can also do this yourself by following the advice in Register Your Book: The Complete Guide to Using ISBNs, Barcodes, Copyright and LCCNs. FAQ: Can I get the files you create when producing my book? Yes! In fact, this is a key difference between AuthorImprints and businesses such as Lulu, Outskirts, and AuthorHouse (Xlibris, AuthorHouse, iUniverse, Trafford, WestBow Press, Balboa Press, Abbott Press). FAQ: I want to do everything myself. Do you offer coaching? Yes. We recognize that self-publishing is a DIY activity these days and tools and services abound. We have worked with many authors and publishers that need just a little advice to get them started in the direction that is right for their skills and book. You can save a lot of money (not to mention time and often heartache) with some early advice. Click here to learn more. FAQ: Can I have someone else design my book cover? Absolutely! We love working with other designers and want you to have the cover you feel best represents your book. But if you wish us to manage cover design, we’re there for you. FAQ: Do you sign NDAs (confidential, non-disclosure agreements)? Yes we do, when there is a demonstrable need to protect the anonymity of the publisher/author relationship from public view. It is certainly not required, but it can sometimes be helpful for self-publishers, especially businesses. Contact us. FAQ: Do you have dogs at your office? Yes, in fact it can get awfully crowded under certain desks. Other times it is simply boring and one of man’s-best-friend will sleep his or her whole day away. FAQ: What is the difference between AuthorImprints and CreateSpace? Personalized service, publishing experience, and advocacy for you the author. CreateSpace is a book printer, book distributor and book design services company rolled into one and part of Amazon. They offer capable, if not cookie-cutter services. AuthorImprints uses the printing and distribution services of CreateSpace, but bring our considerable skills in making sure your book meets your broader needs. More often than not this goes beyond the self-interests of Amazon. FAQ: What is the difference between AuthorImprints and IngramSpark? IngramSpark is a book printer and book distributor. You, as the publisher, will need to design your book, create a cover, program your eBook, and make decisions on all the details that going into the publishing process. You will also likely discover that when IngramSpark distributes your book to Amazon it will show up as taking “1 to 2 extra days” for delivery. AuthorImprints handles all the book production steps, but just as importantly advises you about the various issues and decisions you need to make—and then manages the entire process on your behalf. You get the benefits of IngramSpark distribution and low printing costs without giving up control or incurring extra costs like you would with Lulu, Outskirts, or AuthorHouse (Xlibris, AuthorHouse, iUniverse, Trafford, WestBow Press, Balboa Press, Abbott Press). FAQ: If CreateSpace is free, why do you charge? Can’t I just do it myself? Yes, you can do it yourself. Read our highly popular blog post here about how to do it. We provide publishing expertise they cannot since they are part of Amazon. We also feel our publishing services are superior and give you a better looking final book—a book that meets your goals, not the goals of Amazon. FAQ: Do I have to use CreateSpace or IngramSpark to print my book? Most certainly not! We can arrange to have your book printed by one of our preferred printers at a lower cost than KDP Print* or IngramSpark. However, you will need to need to pay for, store, and distribute these books. These are options that we help you consider, and they depend on budget, marketing program and obviously, your goals for the book. *In August 2018 Amazon announced that KDP Print is replacing CreateSpace. FAQ: Are you affiliated with Amazon? No, we are an independent company that has developed a reputation as Amazon publishing experts. FAQ: Can you get my book into bookstores? Yes and no. We make your book available for stores to order (via Ingram), but you need to demonstrate that your marketing program will result in the public visiting the store to buy the book. Most won’t stock a self-published book unless there is demand, or they will charge you a consignment fee to stock the book for a period of time. In our experience it is expensive and time consuming relative to the level of sales you will achieve. FAQ: Do you do public relations? No, this is a highly-specialized service that requires relationships with media. We work with any author to publish a book, but not every book can be promoted to the media. We have a list of professionals and firms we can refer you to but it is up to them whether they are willing to accept your book. But every book is different so one never knows when a book will breakout. If it does, we’ll be ready to help you. FAQ: How do you decide how much to charge to program eBooks? Our fee to program your eBook depends on 5 factors. Number and type of links (TOC, endnotes, website links). Number of images and whether they need special processing. The type of source file you send us: we prefer InDesign, but Word or a PDF can work although these might require additional special handling. Whether you are submitting a manuscript, or a fully designed book (manuscripts are usually lacking all the necessary front and back matter. Special design considerations such has how to handle fill-in-the-blank forms or strategies for integrating the eBook content with your website and/or multimedia content. You can see examples of our work here, get basic pricing here, or contact us about getting a quote.